An attack on liberal Anglicanism - and on art? Skyler and I sit in the van’s back seat as Sifa eases the vehicle down ‘Eua’s main road, steering left or right occasionally to avoid a mud-filled pothole or recalcitrant pig. On both sides of the road a succession of little wooden cottages, corrugated iron fences flapping in the breeze, and Methodist churches framed by tidy gardens float by. Jim Reeves croons his 1950s hit ‘Bimbo’ on the van’s cassette player. "On your left, to the east, is the village of Pangai", Sifa says. "And that that is Angaha, on your right. Not many places where you can find two different villages on two sides of the road. Strange, eh?" There is much about Sifa’s island which is strange. ‘Eua lies only thirty-odd kilometres from Tongatapu, yet it differs geologically, climatically, botanically, and culturally from the Kingdom of Tonga’s main island. Where Tongatapu is flat, extensively cultivated, and heavily populated, ‘Eua is hilly, underfarmed, and underpopulated. In summer and in winter, ‘Eua is markedly cooler than Tongatapu, which is itself cooler than the rest of Tonga. 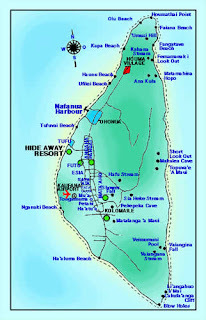 ‘Eua is the oldest island in Tonga – it was created forty million years ago, and thirty million years before Tongatapu, when the Pacific and Tongan tectonic plates ground against one another – but it is in some ways the least explored of the kingdom’s one hundred and seventy islands. In ‘Eua National Park, which was created in the nineties to protect the island’s tract of virgin rainforest, biologists are still discovering new species, like the ‘Eua gecko, which turned up in 2002. Archaeologists have not yet mapped, let alone excavated, the network of ancient forts that runs through ‘Eua’s highland, and speleologists have yet to plumb many of thousands of caves and sinkholes on the limestone island. The relative isolation of ‘Eua has much to do with the peculiar piece of water which separates the island from the eastern side of Tongatapu. The Tongatapu Strait is narrow, especially compared to the stretches of open ocean that separate Tongatapu from Tonga’s northerly Ha’apai and Vava’u archipelagos, and yet its waters are notoriously ill-tempered. Partly because it is located close to one end of the Tongan Trench, the second deepest piece of ocean in the world, the strait is a place where cold currents flowing north from the Southern Ocean collide with warm currents from the tropics. The ferry crossing from Tongatapu to ‘Eua has such a bad reputation that many visitors prefer to fly to the island. Skyler and I avoided eating too much for breakfast before we turned up at Nuku’alofa’s Queen Salote wharf to catch the ferry to 'Eua. We needn’t have worried: the boat’s captain was waiting to tell us that his craft had broken down at the end of the previous day’s journey, and wouldn’t be sailing for at least twenty-four hours. The captain’s vague language and unruffled manner made us fear that the ferry might be out of action for a good deal longer than twenty-four hours, so we headed down to the office of Air Chathams, the little company which has, for some inscrutable reason, decided to complement its flights to New Zealand’s most isolated islands with regular air services to ‘Eua and other remote parts of Tonga. "This is the shortest commercial flight in the world", the twenty-something Kiwi pilot shouted us as he steered his eight-seater off the runway of Tongatapu’s Fua’amotu airport. "Seven minutes long." His words made me worry, because I’d seen a brochure in Air Chathams’ Nuku’alofa office which had boasted that the flight took all of eight minutes. What had happened, I wondered, to that eighth minute? In the context of such a short flight, sixty seconds might make the difference between landing on ‘Eua’s coral-and-dirt runway and alighting on a banana grove, or in the Tongan Trench. "Mind you, the trip here wasn’t short", the pilot went on, as he lifted us over the shaking heads of the coconut trees on Tongatapu’s eastern coast. "We bought the plane off Great Barrier Airlines, took out the seats, filled the space with fuel tanks, flew it up here in ten hours non-stop." The seven or eight minutes passed slowly, as our pilot searched for a passage above sea winds and below storm clouds, and I am pleased now to be in the hands of Sifa, bumping gently along the dirt roads of ‘Eua, with no hazard larger than a lazy chook or pig to worry about. It’s not only fear of sea and air travel which tempts me stay a long time on ‘Eua: Skyler and I are happily ensconced at the Hideaway Resort, one of only three sources of commercial accommodation on the island. The Hideaway is run by Taki, a Tongan Aussie with the shiny scalp and overdeveloped torso of a modern prop forward and the slow, precise speech of a climbing instructor. Taki, who manages the Hideaway on behalf of his extended family, hopes that the deep waters off ‘Eua might become a help rather than a hindrance to the island, by attracting a reliable flow of tourists to look at the whales that travel north through the Tongan Trench into the tropics every year. From July until September, guests of the Hideaway can sit on the homemade wooden benches outside their cabins and watch the creatures cruise up the Tongatapu Strait close to the western coast of ‘Eua. In the summer, when the whales are in Antarctica, most of Taki’s guests are hikers attracted by the rainforest and caves of ‘Eua’s highland. Taki and his staff supply guests with hand-drawn maps and local guides, and replenish lost calories with large servings of roast pork, fried chicken, and lobster. Skyler and I set out from the Hideaway this morning without a guide, largely because we feared a guide would move at a pace which would embarrass us, but we did accept a lift from Sifa, who works at the Hideaway and was heading in the direction of ‘Eua’s highland. As we were climbing into Sifa’s van, Taki pressed a thin piece of paper that smelled of fried chicken into my hand. "A map" he explained. "You can’t trust Lonely Planet – trails get overgrown so quickly. It’s a maze up there." Sifa is driving us south, to the village of Sapa’ata, where a dirt track heads off up to the forested ridge that runs down the eastern side of ‘Eua. "Here comes Sapa’ata", he announces. "Only on the left. Different village on the other side." The arrangement of ‘Eua’s villages certainly seems odd. This is hardly a place of obvious divisions, like the towns of Northern Ireland or Bosnia: there are no walls dividing the communities on opposite sides of the road, unless the rusty corrugated fences that leak chooks and pigs count as walls. People cross the road to buy a watermelon or cabbages from their neighbours, or to retrieve a chook or pig, or simply to chat. And yet a dramatic and tragic history separates villages like Sapa’ata from their neighbours. Like at least half a dozen other settlements in central ‘Eua, Sapa’ata is inhabited by descendants of the people of Niuafo’ou, the northernmost island in the modern Kingdom of Tonga. 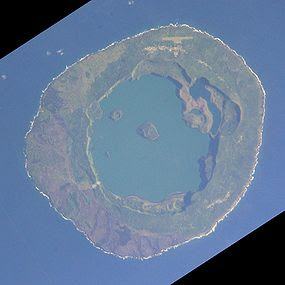 Niuafo’ou is a steep volcano whose crater is filled with a warm lake which contains several islands of its own. Because its lack of a safe anchorage meant that mail and essential supplies had to be thrown from passing ships in biscuit cans, Niua’fo’ou was once known as Tin Can Island to palangi. Closer to Samoa than to Tongatapu, the little volcano was only incorporated into the Tongan Empire in the late Middle Ages. Although they came to identify as Tongans, the island’s people continued to speak their own language, which resembles Samoan more than Tongan. On September the eleventh 1946, Niuafo'ou’s volcano erupted for the tenth time in a century, burying the island’s capital village of Angaha in lava for the second time in seventeen years. 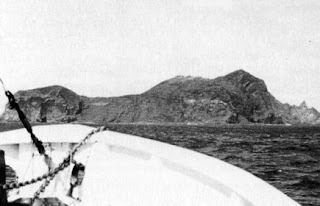 Although none of the islanders died, and most of their villages and cultivations survived, the Tongan government decided that Niuafo’ou ought to be permanently evacuated. In an improvised plebiscite, a large majority of the island’s residents approved the move, and in December 1946 a boat took them south to Tongatapu, where they were housed in a military base before being resettled on ‘Eua Island, at the opposite end of Tonga from their old homes and the graves of their ancestors. Although ‘Eua had been populated for thousands of years, and had acquired, in pre-Christian times, its own local deities and its own storied sacred sites, its relatively small population made it an obvious place to resettle the Niuafo’ou evacuees. A minority of the evacuees resisted resettlement, and demanded a boat to take them home to Niuafo’ou. A frustrated Prince Tungi, the co-ruler of Tonga with his wife Queen Salote, told the homesick evacuees that they had to choose between free land and government assistance on ‘Eua and isolation, eruptions, and a complete lack of government services on Niuafo’ou. In 1958, thirty-nine families were allowed to return to their distant home; by 1976, the population of Niuafo’ou had reached six hundred and fifty, while the number of ‘Euans of Niuafo’ou descent topped two thousand. 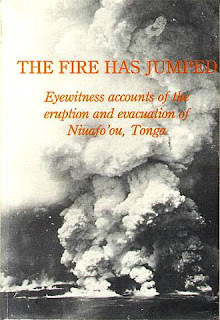 In 1986 the Kiwi anthropologist Garth Rogers, who had written his Masters thesis on Niuafo’ou, published a selection of eyewitness accounts of the eruption and evacuation of 1946 called The Fire Has Jumped. Most of Rogers’ sources were opposed to the decision to resettle in ‘Eua, and he dedicated his book to 'the self-determination and courage’ of the ‘Niuafo’ou patriots’ who chose life on their own island to ‘social security and bureaucratic services on ‘Eua’. In the penultimate chapter of The Fire Has Jumped, Rogers reveals that a small group of Niuafo’ouans refused orders to evacuate their homeland in December 1946, and lived for a year amongst the villages and cultivations abandoned by their kin. One of these twenty-three ‘recalcitrants’ was Palenapa Lavelua, a Niuafo’ou-born man who had only recently returned from a stint working in Nuku’alofa when his island exploded. Dreading a return to the "cold" south where "you have to pay for everything", Lavelua responded to the call to evacuate Niuafo’ou by running into the bush, drinking a mixture of water, sugar, and methylated spirits, and passing out. When he came around, the ship had sailed for Tongatapu. Lavelua was one of the twenty-three people left behind on Niuafo’ou, and he delighted in the freedom that the sudden absence of government and chiefly authority gave him. Food was plentiful, especially because the plantations of nobles and of the government were available for plunder. Lavelua and his companions organised ‘tournaments’ involving games like darts, and held feasts in which they pretended to sit amongst hundreds of their kin. When the handful of ‘recalcitrant’ women left for Tongatapu in a small boat in August 1947, Lavelua and co. reacted in a surprising way: they "decided to go naked". "It was very enjoyable", Lavelua told Rogers. "We even rode horses naked. We kept some clothes ready in case a ship arrived." Eventually the government forced the remaining recalcitrants to board a ship for Tongatapu, but Lavelua returned to Niuafo’ou in the early fifties, and never again left the island. He claimed to have spent his time as an evacuee sick in bed, shivering under a blanket, and to have recovered completely as soon as he landed again in his homeland. Last night, in the quiet open-air bar of the Hideaway, I talked with a woman called Fatima, who was born in Vava’u but lives in Auckland, where she works as a translator for the Tongan community. "It’s a stressful job", she told me. "I’ll get a call at two o’clock in the morning from a hospital or police station." Fatima is almost blind, and I wondered if her condition had sharpened her ear for the nuances of spoken language. "I know Japanese, and I can understand all the Polynesian languages, except Rotuman", she told me. "Rotuman is weird. Sixteen vowels!" I asked Fatima if she had run into the Niuafo’ou language, and whether it is very different today from Tongan. "The Niuafo’ou language they speak on ‘Eua is just a dialect of Tongan", she said. "It’s easy." Sifa also says that the difference between Tongan and ‘Euan Niuofo’ouan is very minor. "There’s just a few words that are different, special", he says, as he swings left off the main road, onto the Ministry of Forestry track that leads into ‘Eua’s highland. Even before the evacuation, linguists had detected a ‘substratum’ of Tongan in the language of Niuafo’ou, the product of centuries of rule from Tongatapu. No scholar has ever researched the question, but it would surely not be surprising if the move to ‘Eua had ‘Tonganised’ the language further. "Do the descendants of the people who were evacuated go home to visit Niuafo’ou?" I ask Sifa. "No. It’s too far away", he replies. "Too expensive." Last night Fatima complained about the five hundred dollars it costs to fly from Tongatapu to her family’s home on the archipelago that includes Tonga’s second largest island and second most populous city. "It’s far cheaper to fly from New Zealand to Tongatapu than it is to fly from Tongatapu to Vava’u", she pointed out. It costs twelve hundred dollars to land with Air Chathams on the grass airstrip on the rim of Niuafo’ou’s volcano, seven hundred kilometres north of Tongatapu. Even if the parrots have absented themselves from our patch of bush, there are tu, grey-bellied doves which flit about beside the path, as friendly as fantails back home, and pekapeka, with their short arched wings and easy swoop, and veka, the earthbound relatives of our earthbound weka. After another half hour or so, we reach the high ridge that runs down the eastern side of ‘Eua. Tall radiata and ferns that look suspiciously like punga and mamaku grow beside the ridge track. Taki told us that Tongans often call ‘Eua ‘lihi Niu Sila’ – little New Zealand – on account of its coolness, its bush, and its hills. Tongans who have lived for a long time in New Zealand before returning home sometimes come to ‘Eua to remember the Waitakeres or the Rimutaka Ranges. More mist is floating in off the Tongan Trench, blocking our views of the ‘Euan lowland and of the island’s uninhabited eastern coast, which is mostly covered in rainforest. Here and there a path opens confidently into the bush, only to be stymied by undergrowth after a few metres. 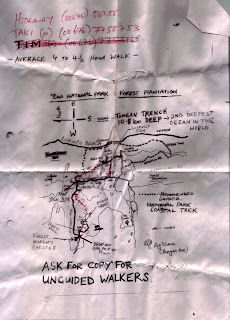 I unfold Taki’s map, and Skyler and I squint at its stains and dotted lines and bent arrows. Somewhere ahead of us a relatively well-kept track climbs from this ridge to the highest point in ‘Eua, which is named ‘Soldier’s Grave’ because it holds the remains of AE Yealands, one of the thousands of Kiwi troops stationed in Tonga during World War Two. Yealands was killed by a Tongan soldier who had been caught stealing batteries from his New Zealand allies. The young Kiwi's photo hangs over the bar in the Hideaway, where his family have twice stayed during journeys to his grave. With the mist still thickening, we decide to head down from the ridge. On the way we make a detour, and walk a few hundred metres to what is reputed to be the oldest banyan tree on ‘Eua. Because the tree sits in a spacious limestone sinkhole, it looks like it is growing from somewhere deep in the earth, perhaps from the centre of the earth. The thousands of roots that flow into its bloated trunk look like dirty stalagmites, or like the tumours of an untreated cancer. The banyan is a popular picnic spot, but I have no desire to linger in the shadows its heavy branches lay down. We head further downhill, devour the cheese toasties Taki made us in an abandoned forestry settlement surrounded by pines, and wander back through mist and drizzle to ‘Eua’s main road. We have taken a different track from the one Sefi drove us up, and we emerge not in Sapa’ata, which is only three or four kilometres south of the Hideaway, but in Ha’atu’a, the southernmost village on ‘Eua. Ha’atu’a is not a Niuafo’ou village, but many of its residents are descended from another group of Tongans who were forced to settle on ‘Eua after a calamity on their home island. Some time in the winter of 1863, a strange boat anchored off ‘Ata, a small volcanic island one hundred and thirty kilometres south of ‘Eua, at the extreme southern end of the Kingdom of Tonga. Although it had been working as a whaling ship, the Grecian was painted to look like a man ‘o war. The ship’s captain, Thomas McGrath, explained that he wished to trade with the three hundred and thirty inhabitants of ‘Ata, and invited them aboard his vessel. One hundred and thirty-three islanders took up his offer; they were never seen again by their families. McGrath, who also took islanders from Niuafo’ou and from the northern Cooks atoll of Tongareva, arranged for the ‘Atans to be delivered to Peru, where slaves from the Pacific were in demand in the early 1860s. When he heard about the blackbirding of nearly half their population, the Tongan king ordered the ‘Atans, who had been living for at least six generations on their remote island, to resettle in ‘Eua, where they would be safer from slavers. The ‘Atans settled at Ha’atu’a, and named their part of the village Kolomai, after the settlement on ‘Ata. Some ‘Atans have lobbied for a return to their old home, but the island’s isolation and lack of a safe anchorage has made the Tongan government reluctant to countenance its resettlement. There is a disturbing connection between New Zealand and the blackbirding at ‘Ata. Although his ship was registered in Tasmania, McGrath had travelled to the Chatham Islands and picked up a new crew there shortly before he began his career as a slaver. According to Henry Maude, the British colonial administrator, ethnologist, and historian who wrote a book about the slave trade in the Pacific, the Chathams crew were a mixture of ‘Maoris and Portugese’. Some crew members were dumped in Samoa when they objected to McGrath’s plan to capture slaves, but the majority were willing accomplices in his crimes. If it is true that Maori from the Chathams assisted McGrath, then it seems likely that these men were members of the Ngati Mutunga iwi which had invaded the islands in 1835 and enslaved the indigenous Moriori people. In 1863 Moriori had recently been freed from slavery, and Ngati Mutunga were beginning to drift back to their north Taranaki homeland in search of new economic opportunities. Did some Ngati Mutunga, desensitised to slavery by life on the Chathams, jump at the chance to help McGrath decimate ‘Ata’s population? After the events of 1863 the Tongan government declared ‘Ata tapu, and the island has had no permanent population for the last one hundred and forty-six years. In the 1930s the ‘Euan bandit Tubou Ngata, or ‘the Lone Tiger’, may have fled to the island and died there after robbing a series of shops and boats. In 1965, six Tongan schoolboys ‘borrowed’ a fishing boat, took it for a joyride around Nuku’alofa’s harbour, got caught by an unseasonal storm, drifted in the open ocean for a week, and were wrecked on the sharp rocks at the bottom of one of ‘Ata’s massive cliffs. In his 1970 book Naked Island, Australian journalist Keith Willey tells how the young men survived for thirteen months on ‘Ata by reviving the gardens and plantations of the nineteenth century, as well as by fishing and gathering birds’ eggs, until a passing ship picked them up. With its tale of ingenuity and courage, Naked Island resembles Robinson Crusoe, except that it features a group of protagonists, rather than Defoe’s solipsistic hero. Skyler and I head north out of Ha’atu’a, but we struggle to identify the turn-off to ‘Eua’s west coast, where the Hideaway sits beside the village of Tufuvai. Without signposts, the many coral and dirt tracks heading left into coconut plantations look the same to us. In the village of Angaha, which bears the name of the buried capital of Niuafo’ou, I knock on a door and ask for help with my navigation. There is a fat book called Tongan Grammar in the small, randomly-assembled library at the Hideaway, but it was compiled fifty years ago by a missionary-linguist, and seems designed to frustrate any attempt to learn a few simple, useful Tongan expressions. The book lacks a dictionary, preferring to dispense the Tongan language via hundreds of examples of obscure linguistic points. That wouldn’t be so bad, if it weren’t for the fact that the example sentences seem to be drawn from manuals written for prison wardens, customs officials, and missionaries. Tongan Grammar has taught me how to ask whether a prisoner has escaped, whether a piece of fruit has been fumigated before it entered Tonga, and whether Saul became Paul, but it has given me no clue about how to ask for directions. After a few minutes of my chaotic attempts to improvise a Tongan-English creole, my plight has become the concern of half of Angaha village. Eventually a couple of small girls are despatched to guide Skyler and me to the safety of the turnoff to Tufuvai. The girls walk us a kilometre or so up the road, giggling shyly when we try to make conversation, and then point solemnly at a dusty coral track that goes downhill between coconut palms towards the sea. With the generosity typical of Tongans, they offer to accompany us all the way to the Hideaway, but we thank them and head off on our own. As we reach the outskirts of Tufuvai, an old ‘Euan village which backs on to one of the island’s few beaches, a boy of nine or ten runs out of a grove of bananas and offers me a large green mango. "Malo" I say, taking a bite. I feel an urge to spit out the unripe fruit, but my tastebuds quickly adjust to its bitterness. "Malo aupito, sai aupito, faka oko ofa!" I say in my atrocious accent, resisting the temptation to ask the boy whether the fruit was fumigated. "Where are you going?" he asks, in mellifluous English. "To Tufuvai" I reply. "You are already in Tufuvai!" he laughs, between bites on his own mango. "Tufuvai is in ‘Eua! Silly!" Maps - these post are just glorious! I've never been to Tonga (or Samoa) and probably never will, but you are opening mental doors and windows- thank you both so much! Malo aupito, Maps, for these frangipani-flavoured reports from well off the tourist track. Gerald Horne's remarkable "White Pacific" gives a US-oriented but thorough and gob-smacking account of blackbirding in the Sth Pacific, an infamous trade in which our own country featured largely. Do Tongans still follow any of the old Gods? TONGA COLLEGE ﻿ all dah way baybee!!!!! Thanks for your kind words Keri. We actually met and had a long chat with a Kai Tahu wahine who was on a working holiday in Tongatapu - she talked about life and politics in the iwi, and insisted that Tonga was similar to Christchurch, which seemed to me a debatable proposition. Thanks very much for the reference Mark. I'm keen to have a look at Rhys Richards' book on whaling in the Chathams in case it has any information about the crew of the Grecian. The article also quotes John Bryan, who was a senior member of the Grecian's crew before he rebelled against McGrath's slaving. The Grecian had sailed in from the Chathams, so it looks like the new crew of 'Maoris and Portugese' was already on board at the beginning of 1863. Perhaps there's some maritime historian who knows more about this matter? Boats and the sea are not exactly my forte! Another fantastic post Maps. Very much enjoying reading of your travels, and very much enjoying the manner in which you write about them. I was hoping to convince you to do your PhD on 'Eua, Edward! I reckon you'd have a great time, because the place seems, archaeologically speaking, to be totally unexplored. Even without digging a huge amount of new data could be gathered. There's also the facts that the climate is perfect - not too hot, not too cold - and that you'd get to eat lobster and pig every night while you were doing your research! That is an enticing prospect. From the look of it it would be a great place to ask some interesting questions - I am intrigued with the idea of an arch survey. There are quite a few people in NZ who are up on the play with this kind of archaeology. Then of course there's the nice environment in which to work as you say. Will have to chat with you about it next time we meet up. Amen to all the praise for this posting Maps. If only our newspapers published travel-writing like this. Thought about a book? Great writing as usual Scott, reminds me of my trip to Fiji in 1973. We flew to Ovalau Island and the French man who owned a boarding house there had a Rotuman wife. We ate fish & fresh vegetables etc from their garden. Here is an interesting book - note the: "..an interesting episode of piracy and blackbirding by the Grecian...."
Search for this on ADD ALL (which I use for comparative pricing etc) - the keywords I used were "grecian" and "blackbirding"
Memo 1 Whaling Ways Of Hobart Town. The book is in Australia. There are only 2 of these out of millions of stores and booksites such as Alibris, Powells, Abebooks, Biblio, Amazon and many others. Certain of these marine books are hard to get and relatively high priced. The other is about $260. There is a specialist Marine book shop somewhere between Victoria Park and the Marina in Auckland. I sold them a book about the sea that was the only one they could find the world! Knowing this book exists means you might find it there, or somewhere else, or in a library somewhere. Found this post while researching Niuafo'ou on Google- what a wonderful surprise! Your writing is excellent, and the first-hand information, which isn't too easy to get either in the library or on the Internet!, is top-notch. Thanks a *bunch* for sharing your experiences! Im really angry to see the rubbish written about Alan Yealands death. I suggest you do your research. I just saw your comment. I apologise for the silly and incorrect story that is sitting there about Alan Yealands' death - I thought I had corrected it years ago. This post was written after my first visit to Tonga, and I didn't then realise that it is foolish to take the stories that are told around kava bowls on islands like 'Eua as truths. I gather that Alan Yealands was actually killed by a Tongan soldier who had been given punishment duties because he had stolen batteries from New Zealand forces. When I was teaching at the 'Atenisi Institute in 2013 I took a group of students to 'Eua, and one of the subjects we discussed, with each other and with the locals, was the death of Yealands. We collected different accounts of the event that are preserved on the island - I think we got five - and considered not only how likely they were to be true but what they might mean for those who tell them today. We also trekked to the grave of Alan Yealands, in an effort to get a better understanding of the story of his death (I blogged about our field trip at http://readingthemaps.blogspot.co.nz/2013/05/expedition-to-eua.html). I thought that Elizabeth Wood-Ellem's essay 'Behind the Battle Lines: Tongan in World War Two' supplied some of the context for Yealands' death. I will, at any rate, correct the details in the blog post. Thanks very much for pointing it out to me.